Tom is already sensing that we are leaving. In his determination to be part of the trip he follows me to the toilet and analyzes my every move like a psychriatrist at a body language convention. At night he curls at my feet lest I try and make a break for it. As usual his assessment is correct because we head off to Birdsville tomorrow. It is deep in Australia's outback and perched just to the east of the massive Simpson Desert. I know the first couple of days of our drive well. After the Blue Mountains we will hit the flat country past Cobar and then the rolling hills that will invite us into Broken Hill. I can just remember the road north to Tibboburra near the border of South Australia, Queensland and New South Wales. Just outside the town are a maze of ancient volcanic rocks called The Granites. Beyond them, for me at least, lies the land of the imagination. This is new country for me, Channel Country, where bi-polar creeks either render the earth impassable for months at a time or make it beg for water. When it does roll down from the North Queensland watershed it flows into Lake Eyre and to the massive sea beneath the sand, The Great Artesian Basin. I am entering that enormous world having left the small one of a hospital waiting room where my daughter Louise has borne her first child, a 10lb baby boy. Young William James, or Billy-Jim, arrived a couple of days ago. I had been hovering in Sydney awaiting that moment. 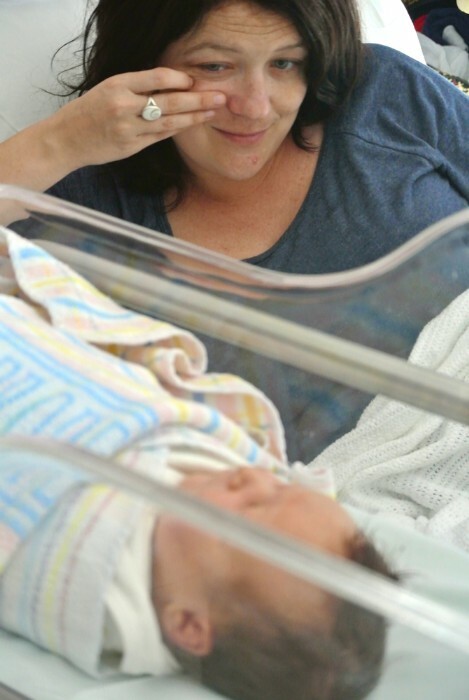 A healthy mother and child outweighs all else and as the birth approached I felt increasing trepidation. Survival trumps everything. Relief preceded joy when I got the message in the modern way, by text, that all was well. Louise lives north of Sydney in Newcastle and to there I headed with my mum to see her second great-grandchild. I won't describe the baby other than to say he is clearly the most beautiful boy ever born and even now displays an intelligence of Einstein proportions. I'll admit to being a little over-awed by seeing my little girl with her little boy. A vision of her from way back came to me out of some old memory bank - of Louise in her cot, feeding her Teddy Bear with a recent poo. The poor Teddy looked like he'd had a lip enlargement gone wrong ... very wrong! There may not have been lip enlargements then ... Maybe Teddy was the first. There certainly wasn't a blog or Facebook. Little Billy-Jim is already a Facebook star. I sent him a cheerio on an ABC Radio interview on Saturday and now he is the subject of this blog. He is of course blissfully unaware of his instant fame. On the second hospital visit I held the little boy. For 10 minutes or so I just looked at him. That's a long time for me not to think. 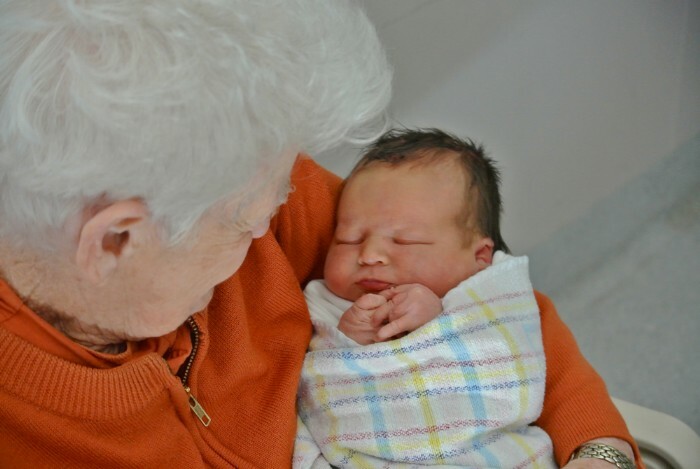 By whatever process it is that binds families together, that lets women go through the pain of childbirth and grandmothers cry with joy as they hold their great-grandson for the first time, I fell in love with the the baby boy. Yep. I love Billy-Jim. The cycle of human life starts with each new birth. That's every Shakespearean tragedy; every Monty Python farce or Gilbert & Sullivan musical; every laugh, tear and cry begun again. Love and hunger are both felt for the first time. Young William is born into deep love and for that we can thank the stars. In a few days, out in the red sands of the Simpson desert, under a billion of them, I will, and from the bottom of my heart. Congratulations mate! A mighty achievment for your daughter (10 lbs - whoa!). By the way, sorry to burst your bubble, but you look every inch a Grandfather (some would say a Great Grandfather, but I'm not that mean). I bet you can't wait until little Billy-Jim can walk. Just think of the walks you could do together! A great reason to stay fit. Good on ya Pops!! Daaaaaaaaaave PS Better watch the shortening to Billy-Jim. Some folks are mighty touchy about shortening their name, hey Raaaay! Thanks Dave. Great Grandfather huh! Lovely. Hey .. you didn't reply to my invite for the book launch. Lovely to see you there. It could get nasty after the launch because I say some really terrible things about you. I'll resend the invite. RayMOND. I know you cant read mate, but buy a book anyway. Fair enough. The only important thing, from my point of view, was that you did leave. I guess someone whose name could be interpreted as "King of the World" has the right to feel a little superior. Re your reply to Susan (below), David White is sounding better to me all the time ... Yo''ll take care on the road now, you hear, Hawky-Ray. Cheers, A.P. Congratulations! Grandchildren bring a whole new light to our lives; I have 3 granddaughters, the youngest, Willow, just got her first teeth! Peace and Blessings to you and yours. Gidday Rosa - He can't speak yet but I am sure he will be a gift. Hey Ian - sounds great - Mind you I cant claim to have been that great with the poo patrols in the past - More the odd skirmish! Best wishes to all of you! You all look lovely! Hi Silvia - Thank you - and say hi to Cecilia! Pops...your joy is ours. As it should be. Congratulations! I'm sure I remember you saying that you may grow up once you become a grandfather... Billy Jim is adorable but agree with David, you could be skating on thin ice shortening his name already!! If you David you wouldn't agree with ANYTHING he said. Hi Raymond - William and James are two really good strong dignified names and you want the poor child to sound american! Come on. Congratulations by the way, new life, new love. Life is good. I reckon he will be just Billy eventually ... or William ... for the moment we are having fun. Dont worry. I havent suddenly become American. Hi Heather - we missed you. Hope you can make the book launch - Yes - Utopia should be very interesting - different culture to I am used to at Hermannsburg - further away from white fellas I guess. I found a beautiful grandchild - much better than Utopia I think. The Aboriginal community will be fascinating. Hi Raymond! 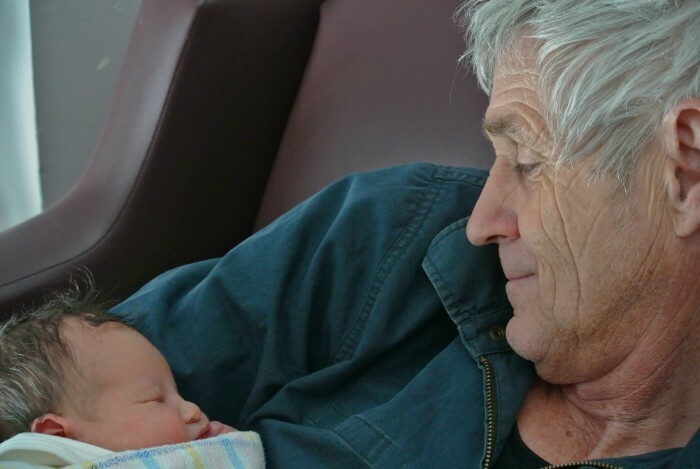 Congratulations on the safe arrival of your beautiful little grandson. He's gorgeous but you already know that. My little Eloise is 11 months old and Billy-Jim already looks about the same size. Safe traveling and give Tommy a cuddle for me. Congratulations, especially to your daughter! Ten pounds... Nothing smells better than a baby's skin. Unless its Tommie after a bath! How wonderful Congratulations, as you enter one into an amazing time of your lives Cheers Beautiful.